A pair of APK Teardowns from both the store and Play services gave away most of the details about how this system will eventually work. 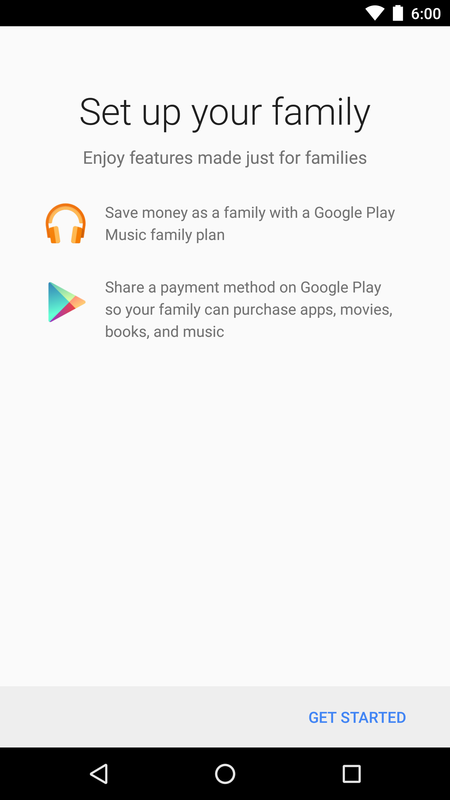 Once Google launches it, family members will be allowed to place their Play Store purchases into a "Family Library" for others in their group to freely access. Of course, there are some general rules about which types of accounts are allowed and how they are managed, all of which were previously covered in our Play services teardown. 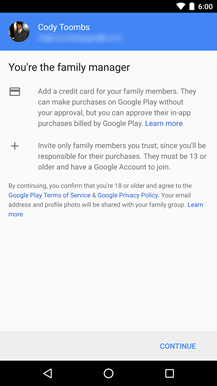 One specific detail stands out because it's likely to be Google's way of preventing abuse: family groups are required to have a shared payment method that all members can access to use for purchases without any authorization requirements. Yes, sharing your music subscription means you're also sharing a credit card. That's not such a big deal if you trust everybody in the family, but remember that this can include children as young as 13, and many people will feel uncomfortable giving a credit card to somebody whose TV-watching habits may have centered on Spongebob Squarepants just a couple of years earlier. There are some restrictions to the shared payment method. To begin with, it cannot be used to buy devices, make purchases with Android Pay, or refill an individual family member's Play Store balance. There is also a special exception for In-App Purchases, which default to requiring authorization from the family manager, but individual family members can be given carte blanche. 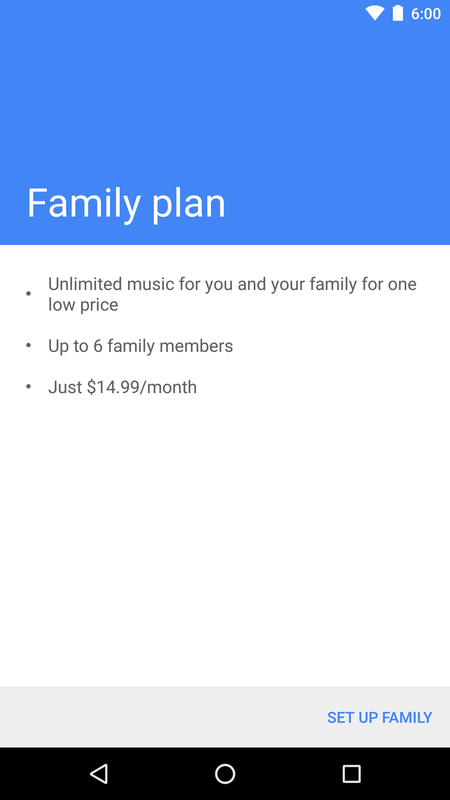 Signing up to the Play Music Family Plan – and setting up a Family Group – is pretty quick. 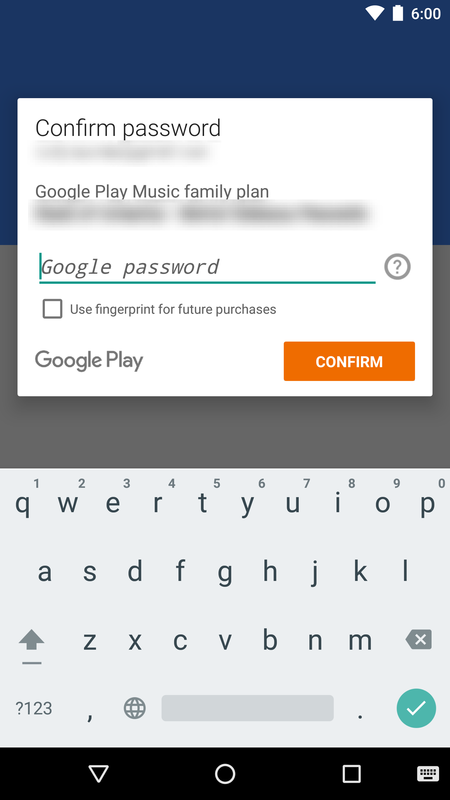 The process starts in the Play Music app. There will probably be a promo card sitting in the stream, but if there's not, the process can also be launched from a link on the Settings screen. 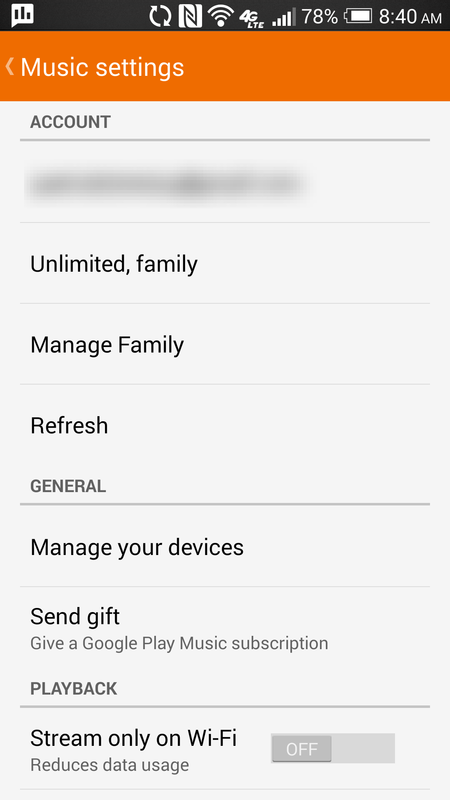 If the option isn't showing up on the Settings screen, tap the Refresh button and wait a few seconds. 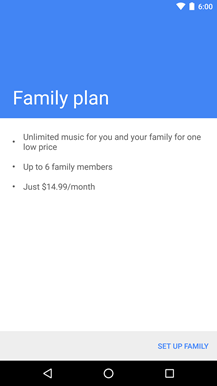 It's worth mentioning that you can go as far as creating the family group without upgrading to the Play Music family plan, but aside from the shared payment method, there's not much of a point to that yet. The first screen explains pricing for the shared plan, but the next two focus on setting up your family. If you're paying attention, this is the first time a shared payment method is mentioned, and it's only in the final screen that it's clear any family member can use the shared credit card without approval. 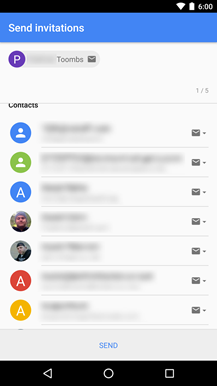 Once you reach the third screen, you have officially created a Family Group, of which you are now the manager. 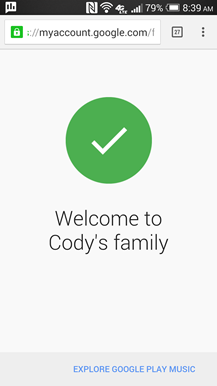 You set up your family on Google Play. 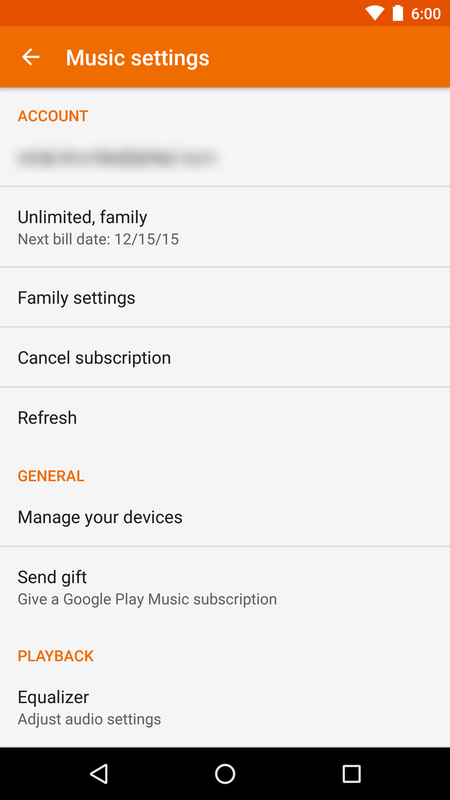 As the family manager, you can see your family's purchases, approve in-app purchases, and manage your family group. 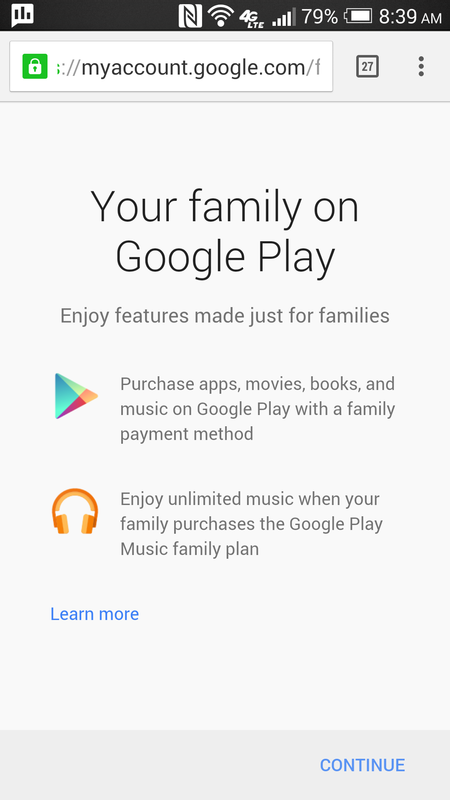 Members of your family group can make purchases on Google Play using the family payment method without your approval. This includes purchasing content like apps, movies, books, and music. You'll get an email notification when someone selects the family payment method to make a purchase. You can also see these purchases in your Order History.Note: If family members have other forms of payment, they can still use those to make purchases. 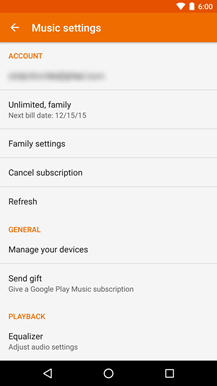 By default, in-app purchase approval is turned on for all your family members. 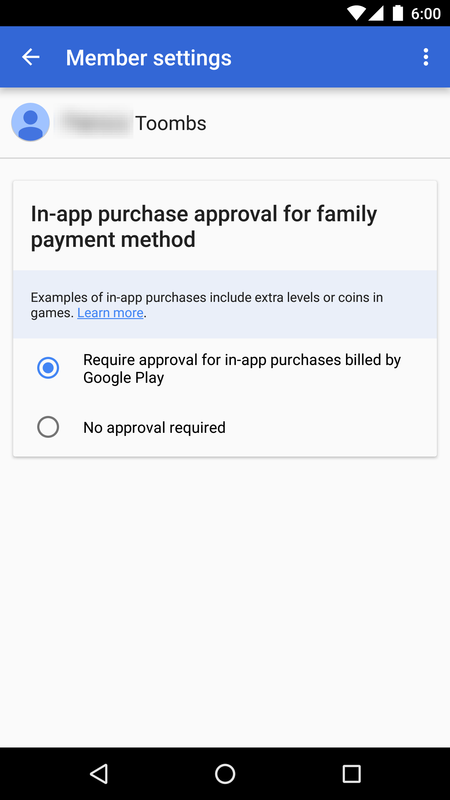 This means they'll need your approval each time they want to use the family payment method to make in-app purchases billed by Google Play, like game levels or virtual currency. 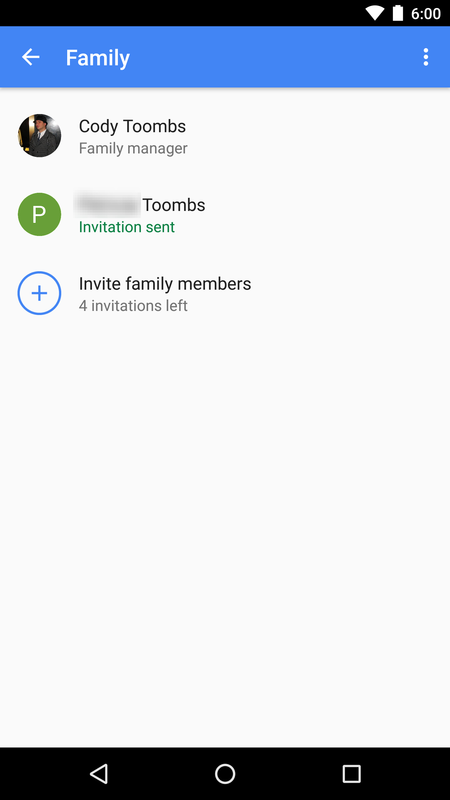 You can add up to five people to your family, and you'll get an email notification when someone accepts your invitation. Invite family members you trust, since you'll be responsible for any purchases they make with your family payment method. 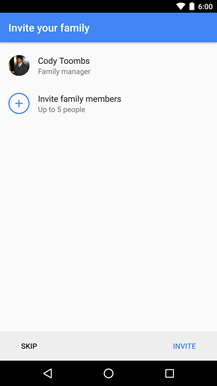 Learn how to add or remove family members. The Parent Guide to Google Play has information about features that help you manage your family's experience on Google Play, like content maturity ratings, parental controls, and other tools for families. The next step is to add people to your family. 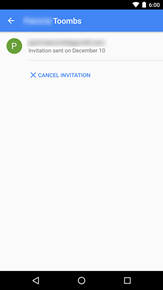 Invites are sent out via email, so you must at least know the address of each person's primary Google account. 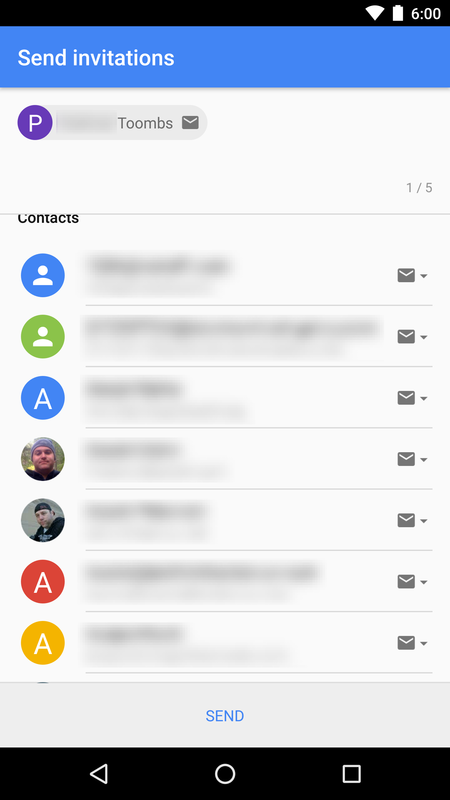 You can browse or search your contact list, or just type in an email address. Remember, you're limited to a total of six family members (counting yourself), so large families might have to get creative about their divisions. 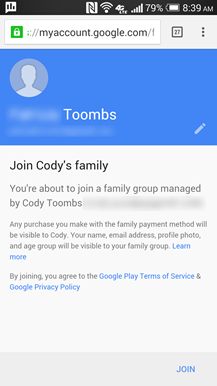 Cody Toombs set up a family group on Google Play and wants you to join. If you do, you'll get access to special features made just for families. 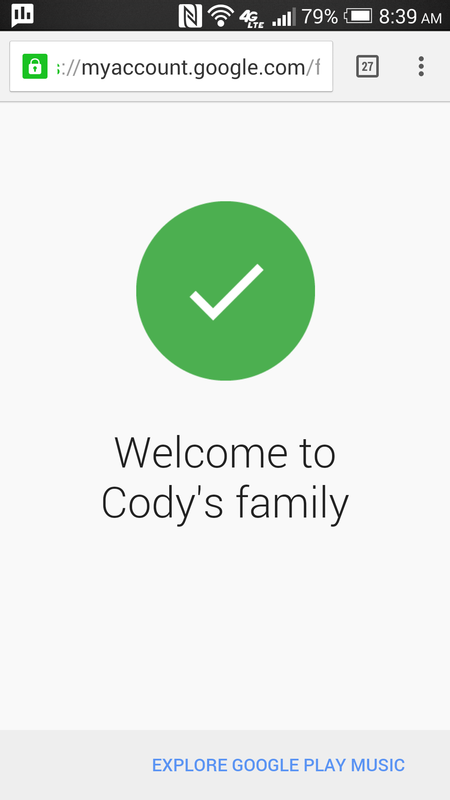 Learn more about joining a family on Google Play. Invite emails are kept short and sweet. 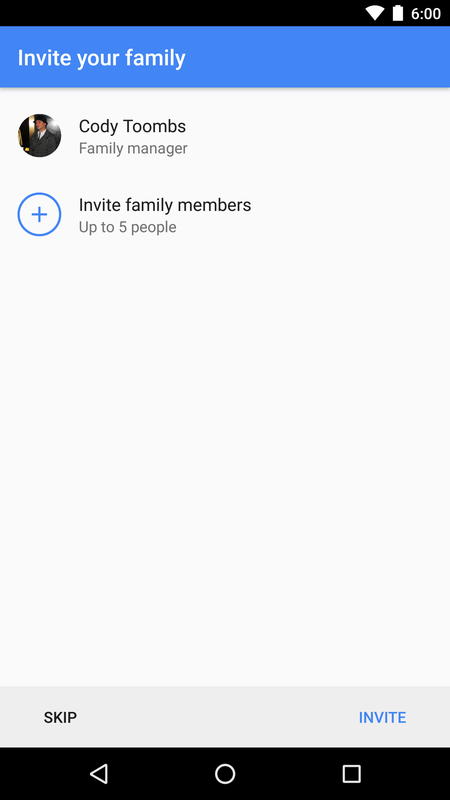 There's just a brief statement about being invited to a family and a button to accept the invitation. I suspect this text will get more interesting once the Family Library becomes active. 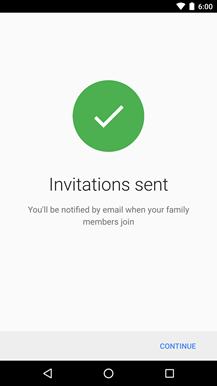 When an invite is accepted, the family manager will also receive an email to confirm the new member. It includes a few useful links and suggestions. 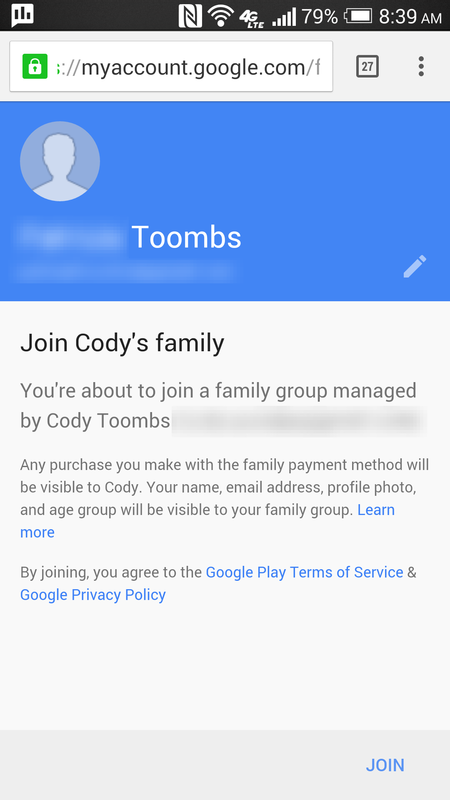 ****** Toombs (***email***) joined your family on Google Play. 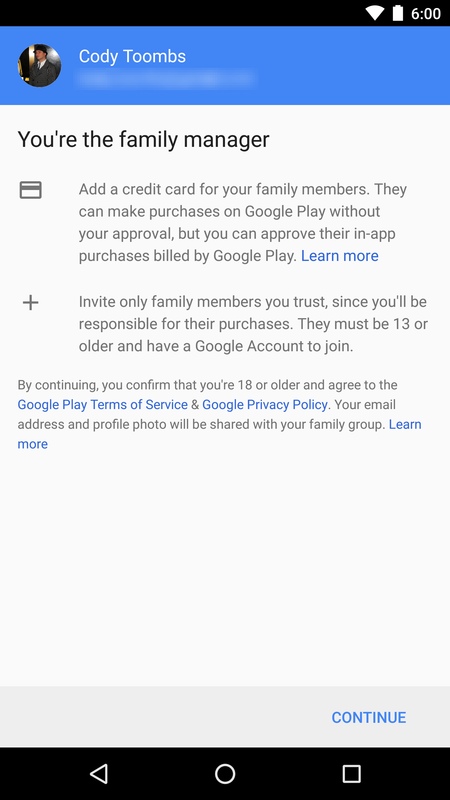 ****** can now use the family payment method to purchase apps, music, movies, books, and more on Google Play without your approval for each purchase. 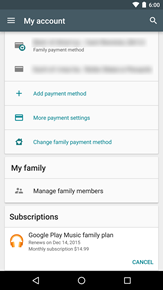 ****** can also make in-app purchases with the family payment method. 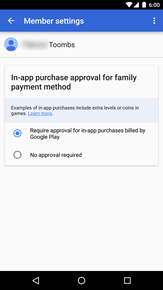 In-app purchase approval is turned on automatically, so ****** must get your permission before using the family payment method to make in-app purchases billed by Google Play, like game levels or virtual currency. You'll get an email notification when ****** selects the family payment method to make a purchase. You can also see all purchases made with the family payment method in your Order History. 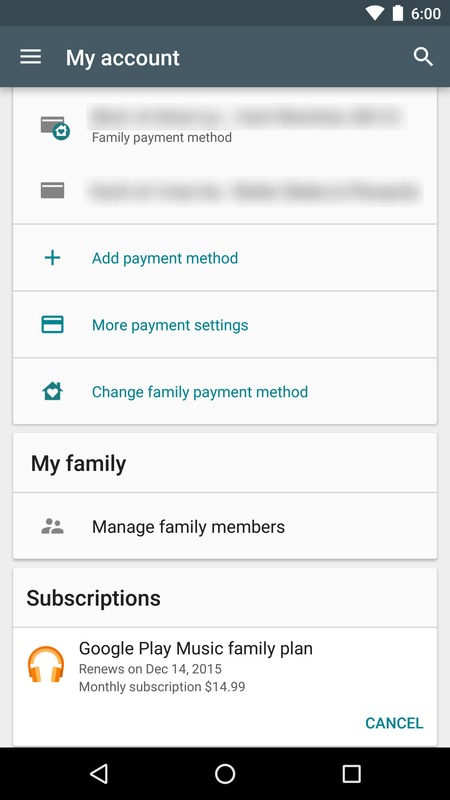 If you don't want ****** to have access to the family payment method, you can remove them from your family group. 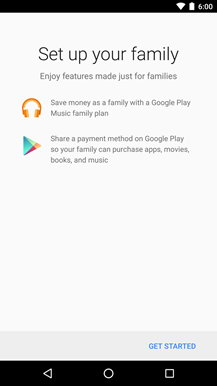 The Parent Guide to Google Play has information about features that help you manage your family’s experience on Google Play, like content maturity ratings, parental controls, and other tools for families. 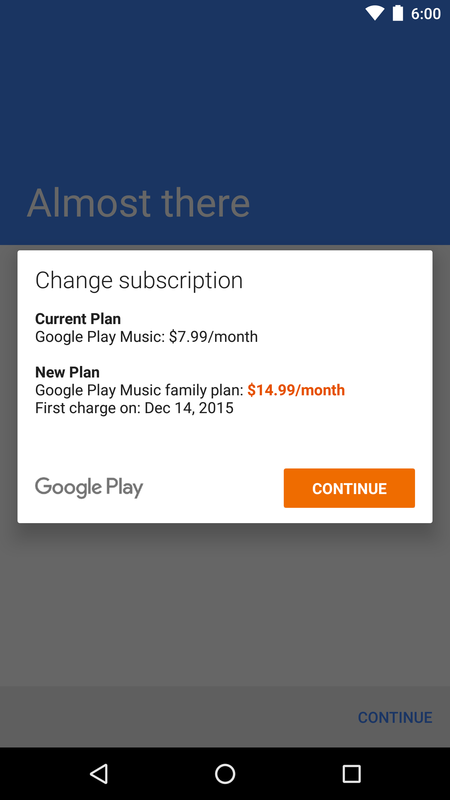 The final step is to carry out the upgrade to the Play Music Family Plan. This just entails going through a regular subscription step that will either start a subscription if you didn't already have one, or replace your old solo subscription. 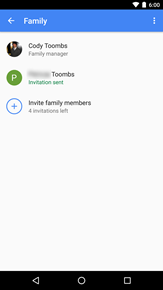 At this point, as family members accept their invites, they will be automatically in the family plan. Once the upgrade occurs, family members will also receive an email to let them know about the new features. You now have access to Google Play Music via the family plan. Your subscription gives you on-demand access to millions of songs, ad-free, on Android, iOS, and the web. Enjoy expertly curated radio for what you're doing or how you're feeling. Bring your music collection with you by uploading 50,000 of your own songs, then listen on all your devices. Plus, download anything you want and listen even when you're not connected. 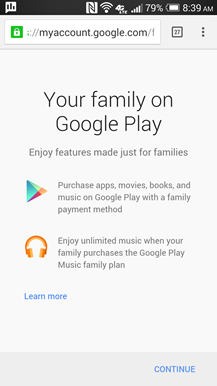 To start, open the Google Play Store app on your phone or tablet or visit play.google.com/music on the web. Learn more. 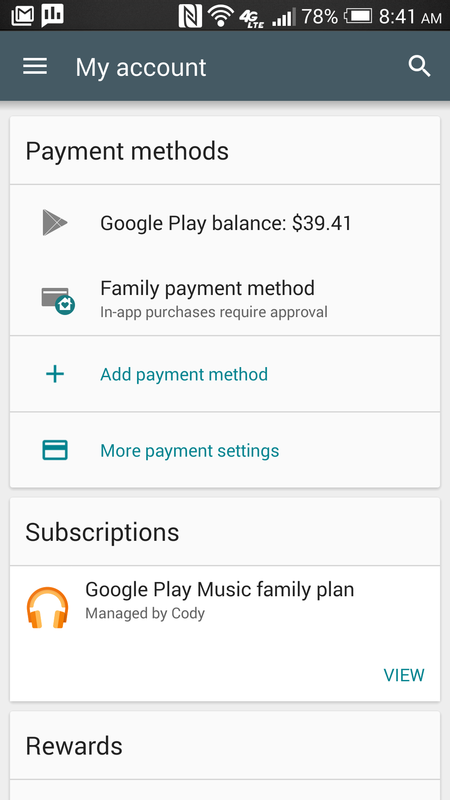 At this point, you can go into either Play Music or the Play Store to manage your family and shared payment method. Both apps launch into the same screens in the store. 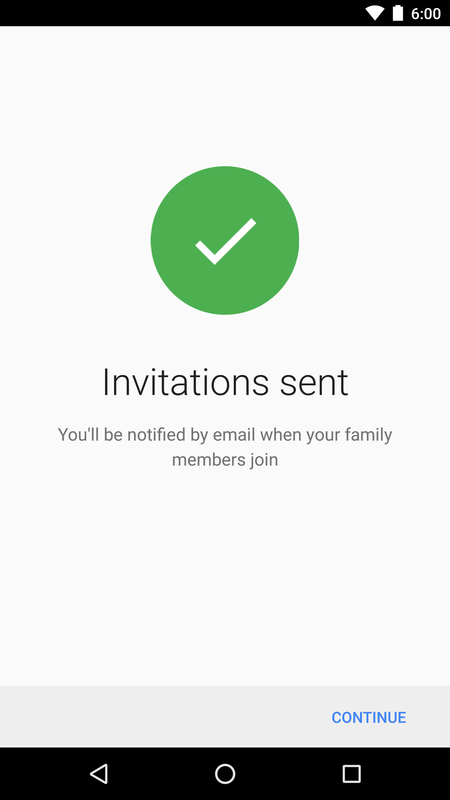 Aside from inviting and removing family members, the only member-specific setting that can be controlled is whether or not In-app purchases require approval on the shared payment method. 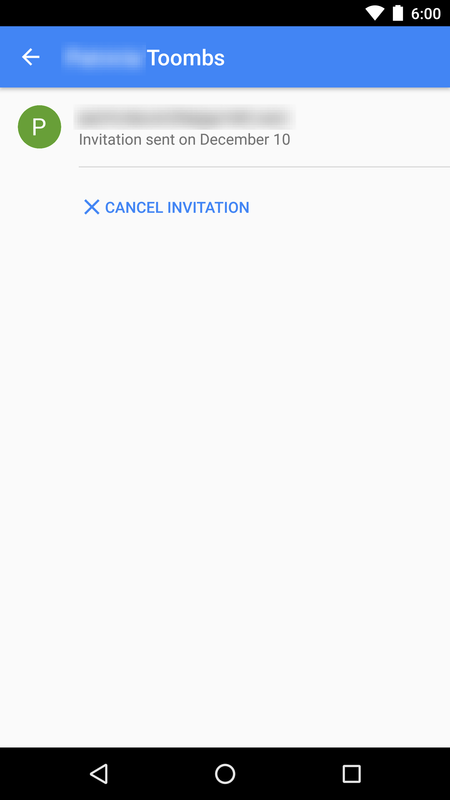 Accepting an invite requires just a couple of taps in a web browser – there's not even a prompt for a password (surprising). And finally, here's what it looks like when you're enjoying a family plan somebody else is paying for. Again, you may need to tap the refresh button to see the changes. It's worth mentioning that every family member can still choose to make purchases with their own preferred payment methods. There's no requirement to use the shared card. 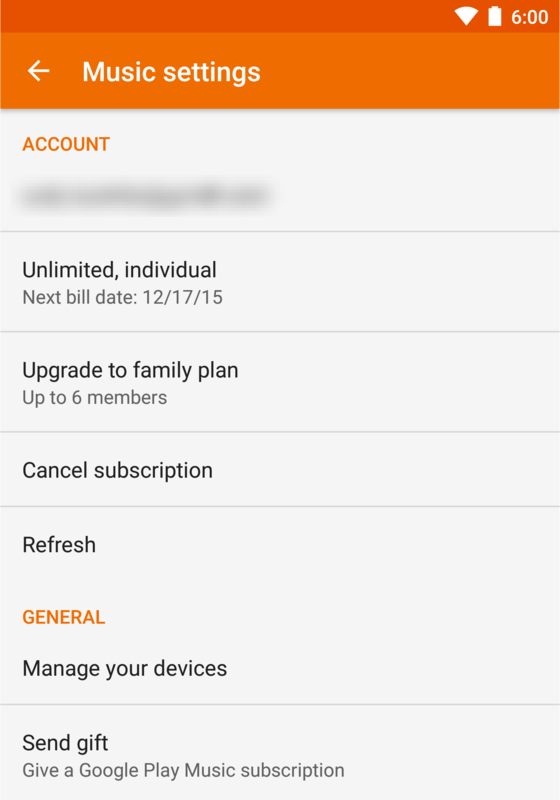 The process for setting up a family group and the shared subscription is pretty quick and painless. There are a few things left to be desired, particularly with regards to curtailing the spending habits of some family members. After all, we certainly want to share our music subscriptions and some content with our children, the elderly, and those with mental disabilities, but we might not want to risk that they'll cut loose and buy every season of every Star Trek series or invest a few thousand dollars in comic books. At the very least, we have to be a little cautious about the people we invite in. 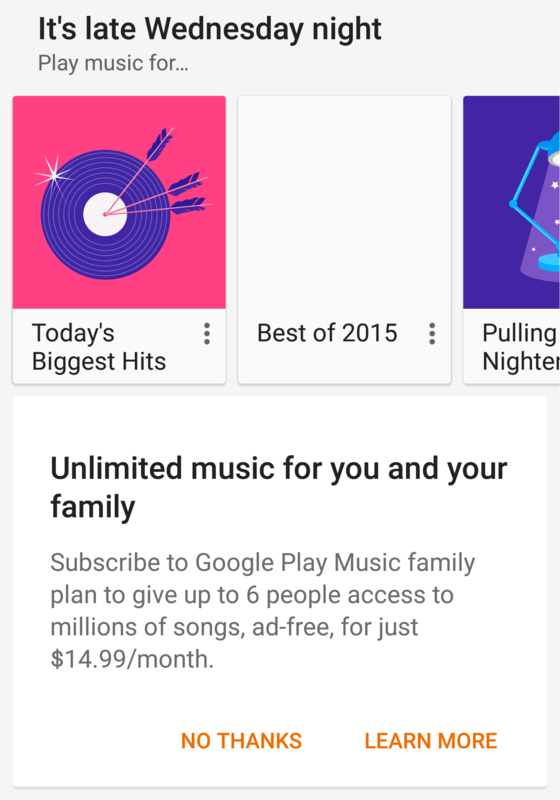 Now that we're looking at most of the components for sharing apps and content, Google might be getting really close to opening the floodgates on the whole thing. Maybe before the new year?